June 11 began as an international day of solidarity with long-term eco-prisoner Jeff “Free” Luers in 2004. At the time Jeff was serving 22+ years. Infuriated by the environmental devastation he saw occurring on a global scale, Jeff torched three SUVs at a car dealership in Eugene, Oregon. The sentence imposed on him was meant to send a clear message to others who were angered by capitalism’s continued war on the Earth’s ecosystems – and to those who were willing to take action to put a stop to it. After years of struggle, Jeff and his legal team won a reduction in his sentence and he was released from prison in December 2009. But in the years intervening Jeff’s arrest and release, the FBI had carried out a series of indictments and arrests in an attempt to devastate the radical environmental and anarchist communities. Two of the people caught up in this maelstrom of repression were Eric McDavid and Marie Mason. Go to the links below for more information about these political prisoners and others. 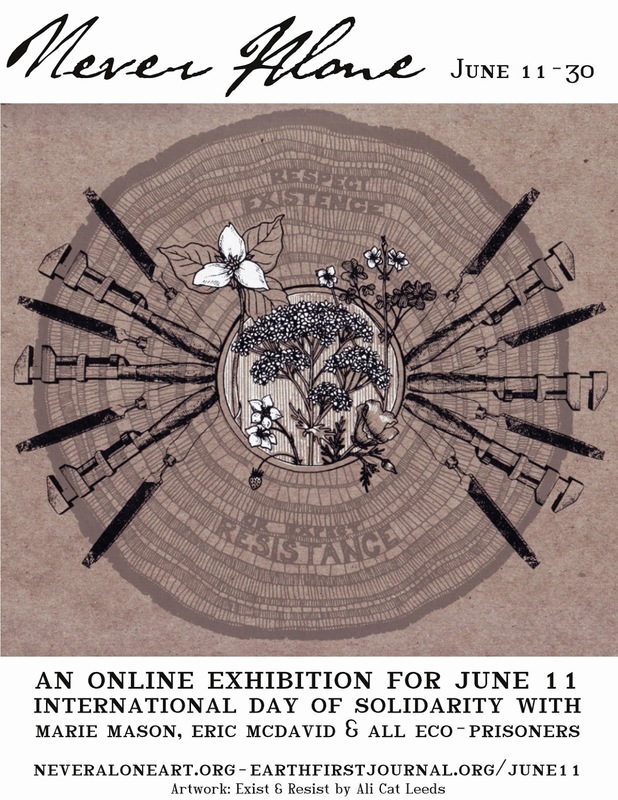 The second link is to a site that is an art show regarding the June 11th focus. We at SubRosa don't have anything formally planned for this date, but the space will be open from 11am until 3pm. Come on down to SubRosa and write a letter to these folks (we'll have material and info available), and/or engage in conversation about how we can support these (and other) political prisoners, act to defend the earth, work to dismantle the prison-industrial-system, offer solidarity to each other AND much more! While it is important to cultivate a culture of resistance, it is also important for us to nurture a culture of caring, for the earth, for each other, for ourselves...and these two ways-of-being are also inter-related. Let these questions be seeds to share about and act on: How is it that cultures of resistance and caring are related? How can we live our lives to bring these more fully into being? And if you can't make it to SubRosa you can do your own thing, by yourself or with others.